Despite record sales and profits, the gunslinger's stock flopped in 2016, and these charts tell you why. Smith & Wesson Holding Corp. (NASDAQ:AOBC) will soon rebrand itself as American Outdoor Brands, a name change that reflects the gunsmith's shift in focus to the broader and much larger rugged outdoors market. Smith & Wesson remains the No. 1 firearms brand in the U.S., and its outdoors and accessories business currently is just a very small component of its operations, but the following five charts can help investors understand why the gunslinger is branching out. Guns are as popular as they've ever been, which is why Smith & Wesson Holding sees this as a perfect time to downplay the business. Image source: M&R Glasgow, via Flickr. There have been few times in recent memory when firearms ownership has been so popular. The percentage of U.S. households with a gun in them has remained fairly constant since the 1990s at around 45% while the actual number of households has risen from 99 million in 1995 to over 124 million in 2015. This means the number of households with guns in them would have grown from 44 million to 55 million today. NICS is National Instant Criminal Background Check System. Image source: Smith & Wesson Holding. 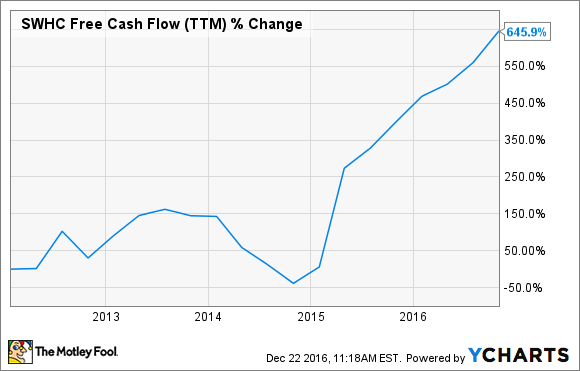 SWHC Free Cash Flow (TTM) data by YCharts. All of this sounds like a case for Smith & Wesson to, well, stick to its guns and continue pursuing a firearms-centric business. The gunmaker still plans to be the premier American firearms company -- and will continue to market and sell its guns under the Smith & Wesson brand. However, gun sales can run hot and cold and though the industry may be less subject to panic buying today than it has been in the past, that also means sales will likely normalize, diminishing the torrid rate of growth the company has seen recently. The following chart shows some of the newly acquired brands to help diversify the business away from firearms. At an estimated $60 billion, the rugged outdoors market Smith & Wesson is buying its way into is four times larger than the firearms market, and subject to much less volatility. Boom times such as Smith & Wesson is currently experiencing is certainly enjoyable, but the bust that inevitably follows is not. A diversification into a separate (though supportive) industry will smooth out those hills and valleys, and make the company's revenue streams more reliable. There are undoubtedly risks inherent in the plan, but it's understandable and commendable that Smith & Wesson has such a long-term outlook.